A mum has shared an all too familiar image social media and frankly, we are so happy she has. The image of her messy dining table, cluttered with craft supplies, drawings and a bowl full of nick nacks, including a mobile phone, has reminded me of my own dining table. Does it also resemble yours? Uh-ha, yep. This mum speaks THE TRUTH! Just look at my living room table right now. The mum goes on to say how the cluttered ‘art installation’ on her table used to bother her. How the first glimpse of it in the morning, and again at night just before bed, would make her stress levels rise. “I’d feel so disordered and had the urge to pack it all away to return to my neat and tidy minimal display,” she shares. Again, this woman speaks the truth. I too have found myself clearing the kids’ art ‘mess’ and even folding the washing in the basket in this picture, for this very same reason. Just to feel more in control and mentally clear. Realising that her former dining table is now a ‘creative spot’ for her kids, the mum says she had to undergo a ‘transformation’ in her mindset and let go of her old ways that were niggling at her to always clean it away. And that’s just it! One of the best things about being a parent is seeing the world again through a child’s eyes and not being so ‘adult’ all the time. It is also about living in the moment. Our kids won’t always draw like they are today – turning hearts into faces and drawing their obsession of the moment (as you can see from our table, it’s space and cicadas for us! ), so let’s enjoy this pocket of time and let them colour away! I love this. And I am going to try and remember it every time I walk past my messy dining table and shudder. I will look at what’s been created there instead. 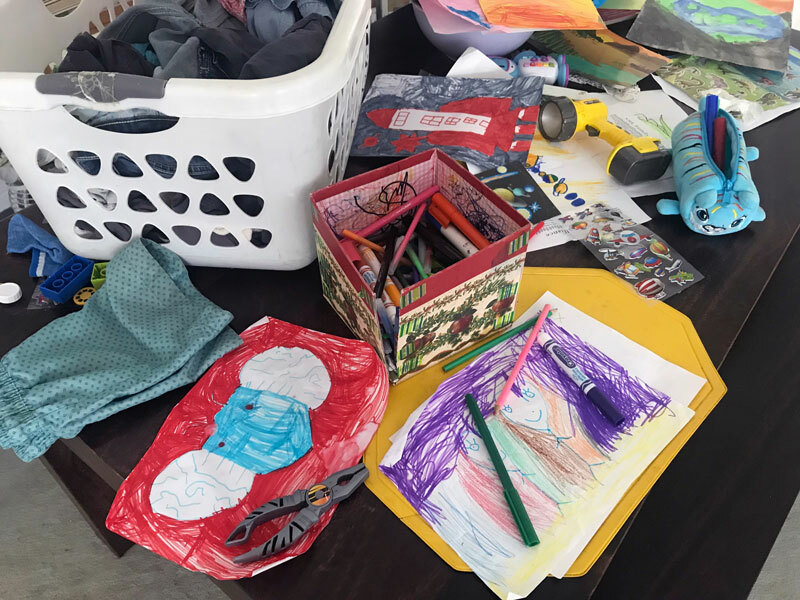 So please be bold, be game and share a pic of your child’s art space – aka your messy kitchen bench, cluttered dining room table or your desk which they have hijacked on our Facebook page. We’d love to see it and also spread this message of what really matters when you live in a messy home with kids.